Fairbanks’ James Yoder (12) prepares to fire the ball against Springfield Catholic Central on Tuesday. Jeremy Ziegler (13) is also pictured for FHS, which won the match, 5-0. 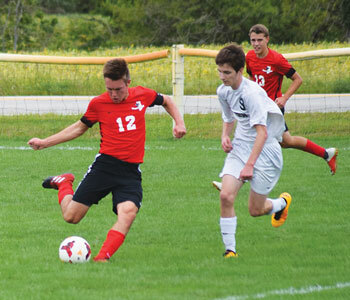 Fairbanks’ boys soccer team played host to Springfield Catholic Central on Tuesday after a long series of away games. The Panthers rolled to a 5-0 victory with 20 shots on goal. The first goal came 10 minutes into the match as Mason Smith connected on a penalty kick. The timer reached the 20-minute mark when the Panthers managed to cross the ball in front of the net twice without a score. The third trip, however, resulted in Diego Shaw’s shot to the back right corner on a cross from Austin Becker. The Irish were called for a penalty in the box with about 10 minutes to play in the opening round. Cade Feller blasted the PK to give FHS a 3-0 halftime margin. Fairbanks played a solid possession game during the second stanza. Becker was credited with the team’s fourth goal in the 69th minute on an indirect kick in the box. Smith had the first touch with a simple drag of the ball. The same two were responsible for the final goal when Becker served the ball in front of the net to Smith, who carried it in on his chest. FHS keeper Weston Lorenz tallied three saves. Marysville’s boys soccer squad played to a 0-0 stalemate against Westerville South. Monarch keeper Mason Taylor turned back a penalty kick in the 67th minute to help preserve the shutout. The Lady Monarchs fell to Bishop Watterson, 1-0. Morgan Roby had eight saves for Marysville.